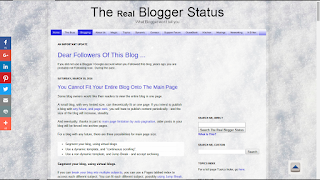 Some blog owners would like their readers to view the entire blog in one page. A small blog, with very limited size, can theoretically fit on one page. If you intend to publish a blog with any future, and page rank, you will have to publish content periodically - and the size of the blog will increase, steadily. And eventually, thanks in part to main page limitation by auto pagination, older posts in your blog will be forced into archive pages. For a blog with any future, and publishing activity, there are four possibilities for main page size. Segment main page, limiting post count. Segment your blog, using virtual blogs. Use a dynamic template, and "continuous scrolling". Use a non dynamic template, and Jump Break - and accept archiving. One of the simplest ways to make your blog reader friendly is to limit main page size, using a post count limit. This won't work as a final solution, however, if you're planning to publish the blog with any regularity. If you can break your blog into multiple subjects, you can use a Pages tabbed index to access each different subject. You can fit each different subject, possibly using Jump Break, onto one page. To complement the virtual blogs, you can have a static main page - providing a "welcome" message, and / or indexing the virtual blogs. For public blogs, a dynamic template, with continuous scrolling, may provide a solution. Dynamic templates, unless you a very comfortable with editing the blog template, will never offer the accessory and customisation possibilities of non dynamic templates, however. With a dynamic template, you won't be able to use Jump Break - though some dynamic views may provide a summarised main page view. Careful use of Jump Break will let you limit the size of the main page. If you continue to publish posts - which is necessary for a blog with any future - you will eventually have posts displayed on archive pages. For best results, design the blog structure - and the posts structure - consistently, and accept archiving and pagination. 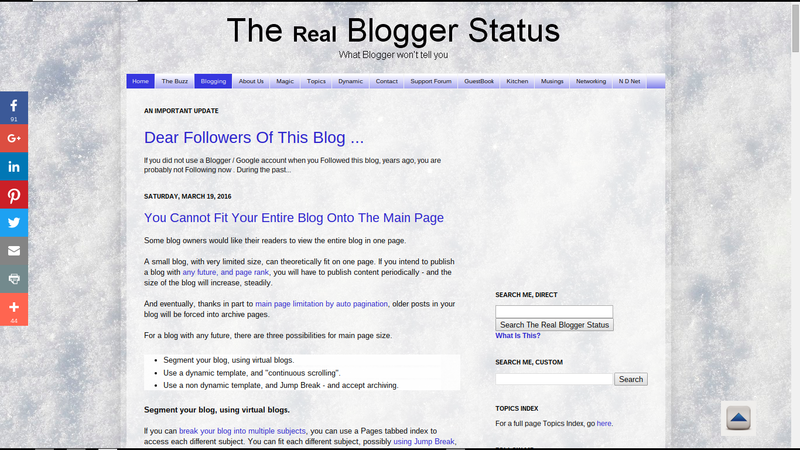 Some #Blogger blog owners would like to display all post content in one page - and ignore page display size. They do not realise that not all blog readers want to read a blog with an unlimited page size, all at once.